When I first smelled Wrappings back in 1990 or so (the year it was launched), it made perfect sense. 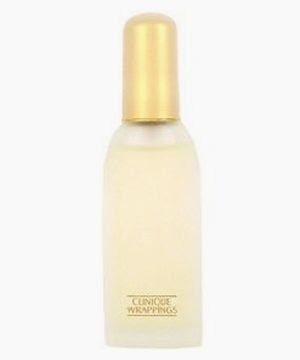 Clinique had only one fragrance, Aromatics Elixir (their sole men's scent, Tailoring, had been discontinued by that point and I'd never tried it), and that was a resolutely strange floral chypre, potent and bitter, pretty much guaranteed to provoke a strong reaction. Wrappings is a little easier to take, and yet it's got a certain degree of strangeness to it, too; it's not out to be universally loved, unlike their next women's scent, Happy, which was a massive success despite not being nearly as good or as interesting as its predecessors. Wrappings explodes from your skin with a dazzling display of aldehydes. It is positively enormous, and joyous, if a little exhausting, in the manner of one of those hearty bigger-than-life people who fills an entire room with their energy. It buzzes with energy, green and vibrant and sunshiny without resorting to the usual citrus notes. It's practically radioactive. There is also, it must be noted, a faint whiff of the latrine about it, something vaguely urinous which has not quite been removed by vigorous cleaning; the first intimation that Wrappings will not be like anything else in the store. In the middle is a cluster of flowers, none of which you can really isolate (although you might correctly guess that this here is probably rose, that over there might be jasmine): it has the bone structure of a floral chypre, with the barest hint of warmth and sweetness, but it's irradiated by that never-ending brilliance which nearly drowns out everything else. It always seems to be teetering on the edge of catastrophic too-muchness. The base has some of the warmer, heavier elements you'd expect--patchouli, the sweetness of old leather, oakmoss--but it somehow remains bright and energetic. Wrappings is as neat a chemistry experiment as you'll find in modern perfumery, because it gives the effect of being composed of volatile, diffusive elements that shouldn't last even an hour, yet despite its endless vivacity it keeps on going; twelve hours after applying it, I can still smell it distinctly. And I think this is at the core of its oddness; it seems to be something that should not exist, that shouldn't be possible at all, and yet there it is, on your skin, larger than life. Much larger. If you can find it--and you probably can't, because the company makes it available for a short time every year and doesn't seem to advertise it, or even acknowledge its existence--you should snap it up: if you end up not loving it, I guarantee that you can find someone who does who'll buy it from you. It costs as close to nothing as a good scent can: I paid $39 for a 25-mL perfume spray --perfume!--and a 100-mL body lotion. They're practically giving it away. The bottle, by the way, is considerably more elegant than that picture up there lets on: a palm-sized collection of contradictions, a hard little octagon of soft frosted glass which makes little shushing noises as you run your fingers over it, angular--almost muscular--but tapering at the shoulders into a golden cap sheathed in more frost, the whole thing imprinted so heavily with its name that you can practically read it with your fingertip. It it simply one of the most beautiful flaçons on the market, all the more reason to own it. Thanks to your tip last week, I am wearing this now!